Add up to 1080p60 wireless video transmission to your gimbal, mirrorless, or DSLR camera rig using the lightweight, compact Mars 300 Dual HDMI Set from Hollyland. 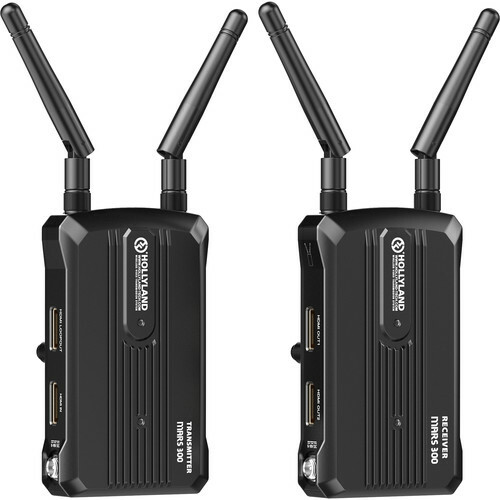 The transmitter provides a single HDMI input plus an HDMI loop-out for viewing on an on-board monitor and the receiver provides two HDMI outputs. Features include line-of-sight transmission up to 300', a built-in L-series battery plate on each unit, and durable metal housings. The transmitter and receiver each measure a petite 4 x 2.4" and are constructed with durable metal housings and a 1/4"-20 mounting thread. Both accept a wide 6-16VDC input range and can be powered using an L-series type battery or the single included DC adapter. The Mars 300 set comes with five antennas (including one spare), a cold shoe, and a 1/4"-20 adapter. Box Dimensions (LxWxH) 7.0 x 5.6 x 3.0"